This is the second part of my previous story: Modern C++ micro-service implementation + REST API where I basically discuss the simplicity you can achive when implementing a micro-service using Modern C++, simplicity that challenges node.js’s with the extra benefit of great performance at no expense in productivity, so if you haven’t read it and you are interested on C++ micro-serivces on your next backend implementation you might want to read that story first. In this occasion we’ll talk about asynchronous request processing and how to handle a request using pplx::task. There are a lot already covered about pplx::task, wrote by very competent folks so the idea here is to show you how to use it in the context of our C++ micro service, to implement REST APIs and a bit of more detail about how asynchrony can help to implement a lock-free micro service that achieves great performance and again simplicity in code, thanks to the elegant pplx library. The pplx::task class follows the approach of chaining tasks together, each task holds its own state and they progress to the next task via continuations. This chaining concept helps mantain in mind that a task maps into a single transaction allowing a cleaner implementation and due to the tasks hold its own state avoids excessive locking. Tasks implement the promise pattern which helps to avoid too much levels of chaining that can lead to poor code readability and reduces latency. Another option expecially for more complex cases could be the use of Fibers or Coroutines, but that is out of the scope of this article. First of all we need to create some infrastructure so let’s say we want to create a user sign-up/sign-on service, so before we continue please git clonethe sample code found here and build it following the instructions in the README.mdfile. Then please come back here and cd micro-service/source and add the files: user_manager.hppand user_manager.cpp using your favorite editor. I am using Visual Studio Code (VSC for short) and you can follow here some instructions to use it for this article too, but you can use vim, emacs, Xcode, Visual Studio, etc. Our user manager micro service will manage the users registration and authentication, so as shown above we are declaring our UserManager class and at the top we declare the type UserInformation, that represents one record in our In Memory database, then we declare UserManagerException derived from std::exception that we’ll use to inform the controller (find declaration in source/microsvc_controller.hpp file) about any problem occurred on aUserManger object. In the middle we declare an alias of std::map<std::string, UserInformation> using the name UserDatabase that will represent the In Memory database, meaning it’s never persisted to a file, it goes away when the micro service shuts down, but it serves to our sample purposes, I leave it to you the code to incorporate MongoDB, Postgres or whatever is your favorite database. First at the top you can see the declaration of a global variable of type UserDatabase named usersDB and a global variable of typestd::mutex named usersDBMutex which acts as a lock mechanism to avoid that multiple threads falling into a race condition mess up our users database under heavy concurrency. Our lock mechanism is a very simple implementation of what a comercial database provide out of the box to access the data under heavy concurrency, we use it only for sample purposes and to handle the concurrency on our In Memory database. The signUp method declares a variable of type std::unique_lock named lock that aquires a lock on our global mutex usersDBMutex. (if possible, otherwise it blocks), this will prevent other threads to corrupt our database. Then under the lock blanket signUp validates the user’s email doesn’t exists otherwise throws an UserManagerException indicating the user already exists. If everything goes fine it inserts the user on the database and leaves but before executes the lock’s destructor which releases the mutex whether there was an exception or not. The signOn method simply validates the email and password provided by the user and returns true if found otherwise false which means the authentication failed. users/signon, authenticates a user using our core service implementationUserManager which following the specification of HTTP Basic Authentication will require the credentials passed encoded in base64 format, so the user and password are not passed on the URL but on the Authorization HTTP header and not in this case but can be protected using SSL, which BTW is supported by C++ REST SDK as well and I’ll cover it in a future article. The code above implements the handler for our users/signup API so let’s go through the code, first we parse the request’s URL, you can find the implementation of requestPath on the file sources/foundation/basic_controller.cpp which returns an std::vector<std::string> containing each part of the path. Then we validate the path variable is not empty and contains the required sections in the path that matches with the API that we are implementing. Finally we use the variable message of type http_request passed as the argument of handlePost, and use the method extract_json that extracts the JSON payload from the request. http_request has this and other handy methods like extract_string, extract_vector, etc. you can check on the reference documentation. The method extract_json() returns an pplx::task<json::value> that executes asynchronously on a thread other than the thread where the request is being served, releasing the serving thread and returning it to the main thread pool so it can serve more requests while the json extraction tasks deals with the JSON body sent in the request, letting our micro service to handle a good deal of concurrency. At completion of extract_json is called what is know as a value based continuation, a continuation that receives a json::value value argument. A continuation as you see acts as a callback, executed after task completion, then inside a continuation is possible to perform another task and so on, here is where you most be careful not to impement too much nesting of tasks otherwise you could end with code difficult to read and maintain. where the continuation parameter in this case is of type pplx::task<json::value>, where we can call theget() method that returns the result produced by the task if it already finished otherwise will block until the task has finished. More on this ahead. on this second option you add an extra level of nesting but a new thread executes and on completion calls the continuation, so you will have three threads instead of two as in the first case when we used the get() method. You might wonder why you want to use these two options? well, let’s suppose you have a really big JSON request that might require some time to receive and then parse, then you’ll probably want as well read the JSON asynchronously keeping the micro service responsive. In the new code you’ll notice right in next line to the path validation, a call to pplx::create_task this function creates a task which returns the type specified in the lambda; in this case it returns a tuple containing a bool and UserInformation. That’s why we declare at the top the #include <tuple> statement BTW. We have created this task to perform the user’s authentication on a different thread than the one serving the request, so again releasing the serivng thread to the pool and serve more requests, while we perform our heavy operation on a separate thread. Reads the HTTP headers provided by http_request on its headers() method, validates the Authorization header exists. Read the credentials base64 encoded into the string variable base64 and decode them into a bytes array using utility::conversions::from_base64(...) utility function. Extract the user and password and pass them to UserManager::signOn method to authenticate the user which on case of success returns a tuple with a boolean value to indicate authentication’s success or failure and the user information on the variable userInfo. otherwise the user won’t be granted access and we’ll send back an Unauthorized error. In the code above you will notice that in case of error an std::exception is thrown on task’s main lambda, but they are catched in the continuation. To be able to do that we need to implement a task based continuation and on the task passed resultTsk call the get() method in other to catch any exception. In the our micro service repository you can find a Lua script that can be executed using the WRK2 benchmark tool that shows some pretty good results as shown on the README.md of the project. You can create the Lua scripts to test our REST APIs following the ones found under tests/wrk. 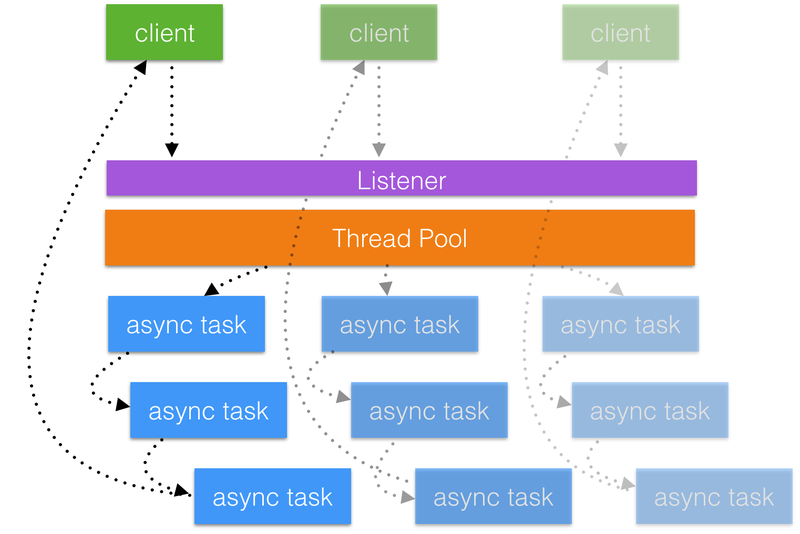 As you can see the asynchronous execution of each request on the server allows us to have a listener thread pool quite responsive due to the lengthily processing can be decoupled from the serving thread releasing it to serve more requests while the lengthily operation can inform of its results on the thread is running. Additionally the simplicity of the pplx::task API allows us to create again code that challenges other productive tools with the benefit of astonishing performance, in next article I’ll talk about how to run this micro service inside a Docker container. Full stack Software Engineer, C++, C#, Java, Swift and Objective-C developer, Backend development as well as iOS apps, Progressive metal fan, Swim enthusiast.